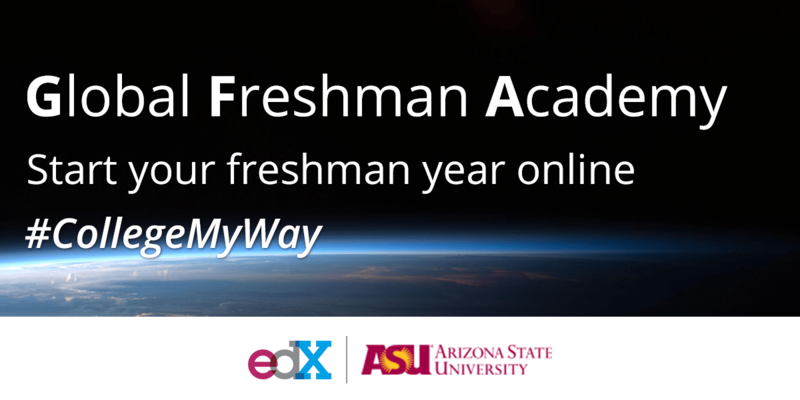 There was a big announcement in the world of MOOCs the other week: Arizona State University (ASU), the largest public university in the U.S., and MOOC provider edX announced the Global Freshman Academy. ASU will produce a series of online courses on the edX.org platform that anyone can take. Learners who pass a course can apply for and obtain college credit from ASU at tuition rates at a discount to the standard cost. Coming from a large, well-respected university, these credits have a high likelihood of being accepted for transfer at many schools–on the ASU transcript, it will not even indicate that the credits were earned from an online vs. on-campus class. ASU and edX plan to offer at least a dozen courses starting this fall, making it possible to take an entire first year of college online via MOOCs. This article will explore this news in depth, describing the details that have been announced, indicating some of the reactions of the press / pundits, then speculating on who might be interested in participating in the Global Freshman Academy. A – This is a huge step and foreshadows a revolution in higher ed! Okay, except for Anant Agarwal who made the announcement, not many pundits are saying this–which is understandable given the MOOC hype in 2012. However, several have pointed to the pass-before-you-pay aspect as innovative, with the Washington Post calling it a groundbreaking idea. Others have noted previously that, save a few small exceptions, there has been an impermeable wall between modern MOOCs and credits, and that once some universities started to “yield”, and offer credit for some MOOCs, others will have to follow to keep up. Could this a crack in that wall? D – This is the start of something really bad. For some pundits, this announcement indicates looming trouble ahead. Some feel that college credits will get devalued through online classes that are inferior in quality, and John Warner, in an Inside Higher Ed blog, raises the concern that ASU may start to offer credits for non-ASU created courses in the edX catalog, in essence, “cleaning” the credits of their online origins. Jonathan Rees is concerned that this is the start of a new phase of academic competition, where schools will undercut each other on price for credits, with the ‘winners’ ending up with massive classes, while other schools see their revenues fall, with faculty cuts being the inevitable result. These are certainly important issues to discuss as higher ed goes through the inevitable changes in this technology-driven age. A through D is quite a spectrum, where does Class Central fall? Somewhere near the ‘B’ camp. 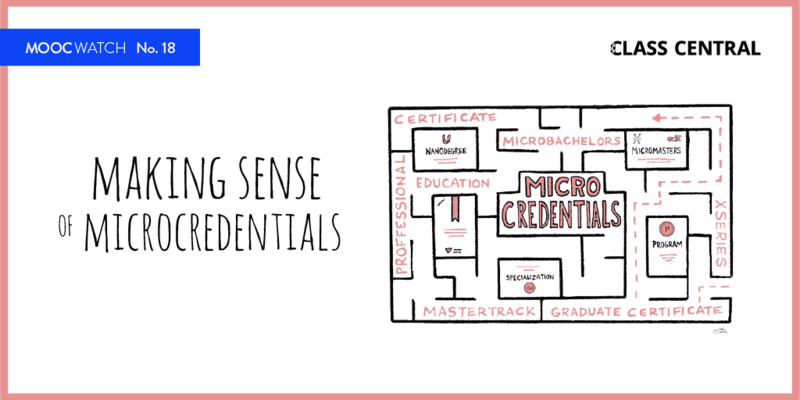 This initiative does appear to be a major step in breaking down the MOOC-to-credit barrier, and the access and ease of starting an edX course without much paperwork is likely a bigger benefit than many realize. In the U.S., the GFA should offer a huge convenience and brand image advantage over community college, but it remains to be seen if engagement and motivation will be widely sustained in this format by the prospective students that are attracted to it. For international students, the GFA seems like a great option to have access to, whether they want to apply to the U.S. or stand out at home. Our main observation however, is that these types of experiments usually don’t end up being utilized in the way people expect or predict. Although the initiative has the vision of “first year free”, the majority of the use may be students who knock out a few classes in order to take more electives, adults dabbling to see whether they want to go back to school and earn a college degree, or high school students looking to burnish their college applications. This might be like the overall MOOC phenomenon itself: providing a lot of value, but not necessarily for those initially envisioned, and not used in the way initially anticipated, per the lofty vision communicated at the outset. Who Might be Interested in Global Freshman Academy? 1. Those who want more flexibility in scheduling their university schooling. Students in high school (or maybe the summer before college) may want to take one or more GFA courses prior to starting college, so that they can get into electives more quickly. If they use this as a way to aid in graduating early, it can shorten the college experience, but if they still use the full four years, they are essentially lengthening it by starting early, allowing for either more electives, or a less hectic courseload. Note that students may want to check with their school to ensure that they will accept ASU credits. 2. Those who are considering community college, but want the flexibility of an online class. For those that may want to take community college classes for credit, GFA courses can provide supplemental options to take courses that are not offered at the local community college, or are difficult to take for logistical reasons–a major benefit of modern MOOCs, after all, is that they can be done on your own time, but at the same pace as a cohort, thus providing flexibility while still giving some feel of a class. 3. Those who want to try out a university course, and get credit in case they decide to continue on. For those that are thinking about going back to school to get a college degree, this can be a good choice. You can sign up for one with a few clicks of the button, and see whether you like the experience and want to continue. Once you pass a GFA course, if you think it likely that you will continue, then you can apply for the credit so that you will have it for the future. Note that you will need to sign up for the $45 Verified Certificate just to have this option. 4. Those who are interested in attending ASU! Whether you are in Arizona, out-of-state in the U.S., or a student in another country, perhaps you are interested in applying to ASU. If so, taking a GFA course might be a good way to get a little better feel for how instructors teach there (one of the five reasons high schoolers should consider MOOCs). And the good news is that there are no concerns that the credit you earn will not be accepted. Perhaps this is a side benefit that ASU is hoping to gain from the initiative, gaining more exposure for the school and connecting more people to it. Ultimately, we will see who and how many the GFA appeals to. And the good news is that, like the San Jose State experiment, we’ll get answers to at least some questions in a relatively short period of time, in as little as a year. That’s a pace of experimentation and learning that should be a big benefit for further innovations in higher education. You can see information about edX’s Global Freshman Academy, and even enroll for the three initial courses here. Please , this article is trying to convince people that ASU İS DOİNG SOMETHİNG GOOD . ASU DOES NOT NEED EDX at all and share its revenue with them . 2.- ASU has already 13,000 onlinme students. wonderful professors for course development + online platform . 4.- ASU has a wonderful President Dr. Crow . Everything said here can be done by ASU and keep the profit to itself . Even one thing damaging, that is to associate ASU credit programs with MOOCs. So far MOOC has negative value in the market . Thanks for your comment! I think you make a good point that ASU has a fair amount of experience online. One thing to keep in mind, though, regarding the value of partnering with edX, is that having courses listed on the edx.org platform and promoted by edX will probably have a much wider reach than ASU can have on their own. I appriceate your comment very highly . First of all I like edx from the start. They caused top universities to provide online courses, also they made online popular within 6 months . Online has been in the USA for 20 years but always neglected and down valued . So the reason is marketing is better with EDX . 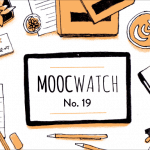 MOOCs are getting down valued every day so does edx as well unfortunately . ASU does not need marketing. They have already 13,000 online students with $ 1,600 fee per course . If ASU brings down the fee to $ 500 they can have 50,000-60,000 to be registered. They can . Ask me ONLINE cost calculation http://www.mgozaydin@hotmail.com . I will send you one . The cost is much less than $ 500 per course . Dr Crow is very intellegent president . I do not think he is doing it for marketing. He has something else in his mind . What is it ? He prefers not to discuss it . That is not good . I follow online for the last 21 years . I admired edx very much since they caused top universities to provide online courses . But I am asking from them now online courses from TOP universities for credits and degree . Look up Georgia Tech master degree online program . This is what all universities must do . Look up also University of Oklahoma History class online for credits $ 500 per course . There is no prerequisites , that means couırse DOES NOT HAVE ANY LEVEL OF INTELLENGENCE . Is it a junior course or graduate course ? 150,000 or so people start but only 2 % finish it . It is waste of time and Money . 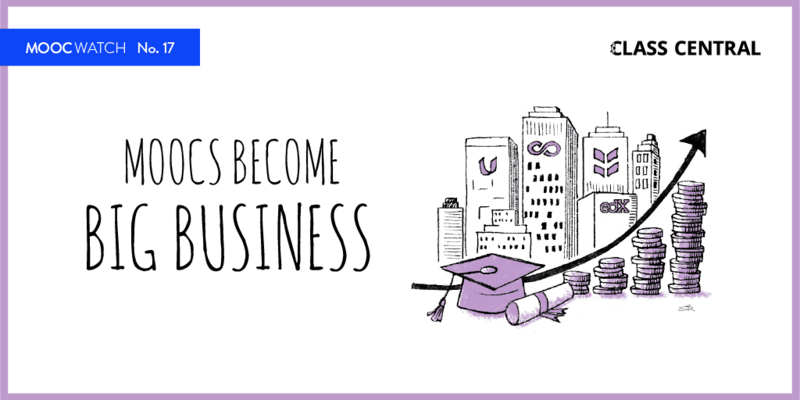 Universities are doing it just for the sake of marketing . Then MOOCs do not have any academic value . I expect an answer from President Crow . Best regards and billion thanks for your thoughts. Thanks for sharing your thoughts as well Muvaffak!